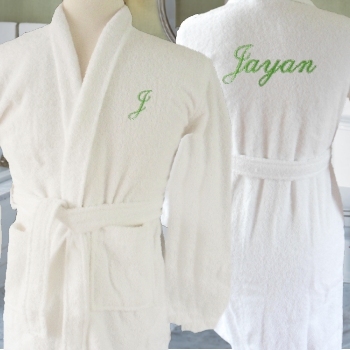 Childrens terry bath robe personalised for boys or girls sized 10-11 years. Childrens white robe in soft terry towelling material for comfort and absorbency after bathing combined with easy care and quick drying. Fits approx size 10-11 years. Have a short name or initials on the front, perhaps a name or nickname on the back, or choose the option and have embroidery on the front and back of the robe. Your choice of thread colour and font style. This kids robe will be customised to order within 3-4 working days.